One of the joys of winter, at least for me, is roasted veggies. I avoid the oven in the summer. In the spring there is always something new popping out of the ground and fall seems to be soup weather followed by turkey, turkey, turkey. 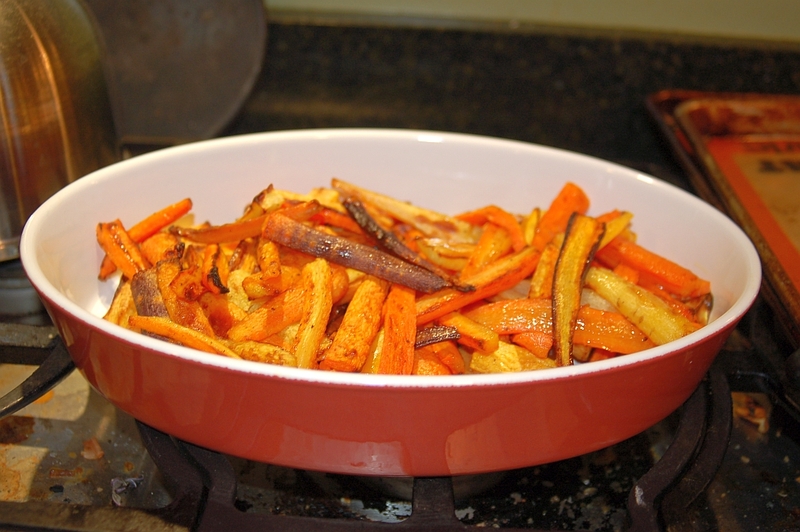 Roasted carrots, with a bit of olive oil, salt and pepper couldn’t be easier. Preheat the oven to 425°F (or 450°F if you have convection). Line two baking sheet with parchment paper. Peel carrots. Quarter the carrots lengthwise and cut into 3″ sticks. Toss with olive oil, sprinkle with a big pinch of salt and about 20 grinds of pepper. Roast for 20 minutes; rotating and swapping the position of the sheets half way through. The rotating and swapping can be skipped if you have convection. Carrots are done when easily pierced with a fork. I made these a couple of hours ahead of dinner to free up oven space later in the day. I transferred them to a bowl, covered it with plastic wrap and put it in the microwave for safe keeping. I reheated it for about 2 minutes before dinner and gave it a good shake to get any oil that had settled on the bottom reapplied to the carrots. This entry was posted in Recipes, Side, Vegetarian and tagged carrots by Bob Gill. Bookmark the permalink.